I & E Cabinets and Deborah Leon, a superb designer, worked hand in hand to bring old world Spanish charm using dark cabinets to a kitchen with limited space. The results are beautiful and airy. Each of these pictures depicts our actual work. The options for small kitchen designs will surprise you when a professional designer works directly with a professional renovator. This is exactly what I&E does expertly. If you are a long time subscriber to this blog you know “don’t settle” is repeated quite frequently. We mean it. Just because the space you have is limited does not mean you must use all light colors. Nor does it mean you must fill every cranny with a cabinet to store away your food, dishes, and other necessary items. 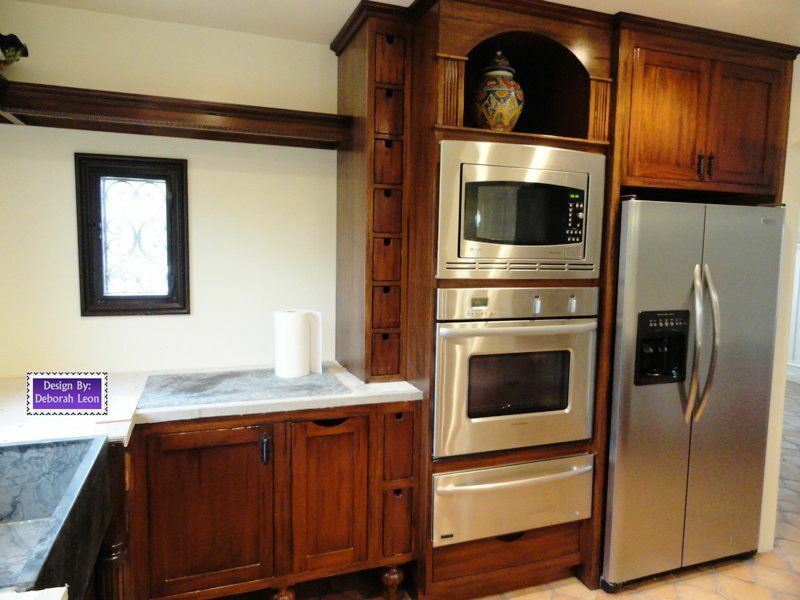 Wall to wall cabinets make a small space claustrophobic for many people. All white and light cream colors can stifle choices and not blend in with the personality and true desires of every household. In order to make a small kitchen design work to create a feeling of openness while using dark woods a walk in pantry was built into one corner. Everything that normally would fill cabinets on the walls still has storage, plus some! This freed up the walls to be gleaming clean white and host three windows. The little extra window with a dark wood accented sill and exterior iron filigree elevates the feel of openness beyond what could be accomplished in any other way. Not having traditional cabinets hanging on the walls above the counter also allows special accent lighting that further makes the space feel larger. 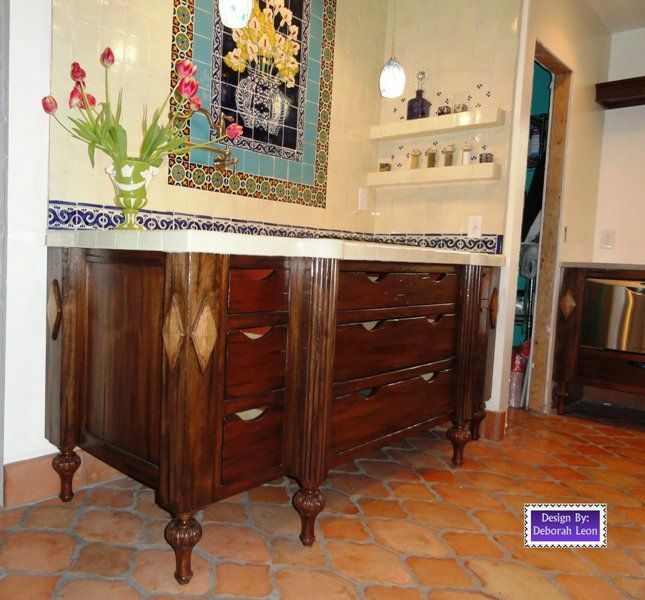 The eye is drawn to the decorative tiles and built in cutting board. This small kitchen design is held together by the consistent feel, unbroken by using a stove range with built in oven. Details abound in this lovely kitchen. Cabinets that do not go all the way to the ground stand on beautiful little carved legs, an archway alcove above the restaurant class wall mounted stove and microwave, canned lighting, hanging glass lamps, carved elements on the cabinets, a stunning stove backs splash and two tiled built in spice shelves make this small kitchen design one that draws you in and makes you want to linger. The placement of the kitchen elements is not just beautiful. It is designed with ease of use in mind. The stove top has drawers underneath to hold the pans and other cooking tools. Favorite spices are immediately accessible. There is usable counter space on both sides of the stove with the refrigerator directly across. The water spigot above the stove allows two people to use the kitchen and have everything they need within reach and not be forced to dance around each other. 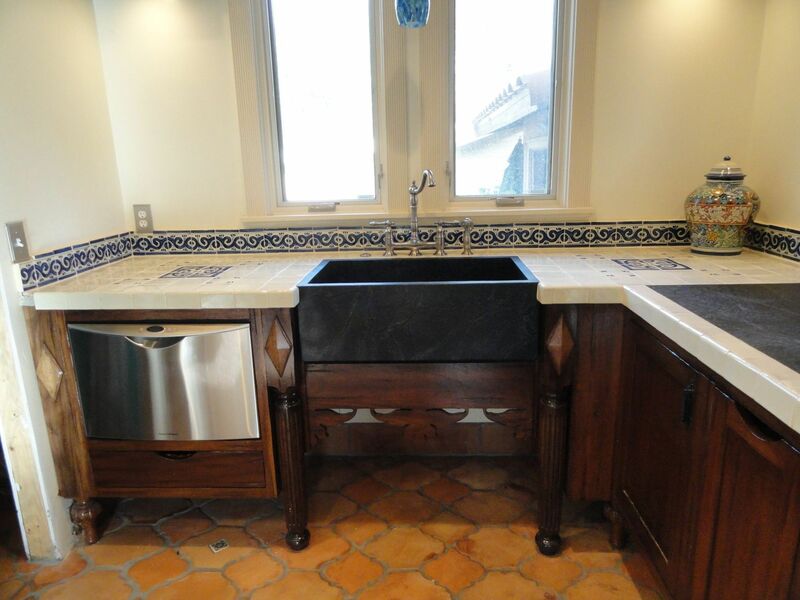 A very large sink and inlaid stone cutting board are immediately next to the stove and microwave. Dishwasher is next to the sink, also. I am thinking of doing a part 2 right now on Small Kitchen Design. What do you think you would like to see in it?